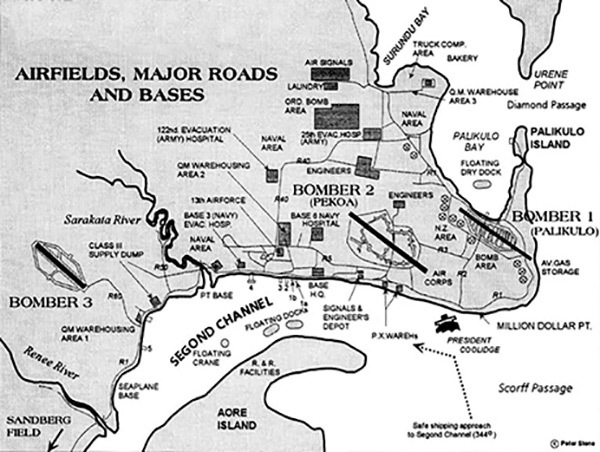 Indicated are Segond Channel, Sandberg Field, Renee River, Seaplane Base (Luganville Seaplane Base), QM Ward-Housing Area 1, Bomber 3, Class III Supply Area, Sarakata River, Navy Area, Base 3 (Navy) Evacuation Hospital, QM Warehousing Area 2, 122nd Evacuation (Army) Hospital, Naval Area, Base 6 Navy Hospital, Floating Docks, Floating Crane, PT Base, Base H.Q., Signals & Engineer's Depot, Bomber 2 (Pekoa), Engineers, Air Corps, N. Z. Area, Bomber 1 (Palikulo), AV Gas Storage, Million Dollar Point, President Coolidge, Palikulo Island, Palikulo Bay, Floating Dry Dock, Diamond Passage, Q. M. Warehouse Area 3, Bakery, Truck Comp. Area, Surundu Bay, Air Signals, Laundry, Ord. Bomb Area, 25th Evac. Hospital (Army), Aore Island, R&R Facilities, Aesi Island, Undine Passage, Mavia Island (Mafia), Peterson Point, Matte Vulu Island, Fighter 1 (Turtle Bay Airfield), Matevulu Blue Holes, Nalaiafu River, Vaucluse Passage, Urene Point.